Many WordPress sliders are simple and difficult to customize. Many of them come bundled in a theme, and you may be able to add slides or change the speed, but there’s no way to customize them further without essentially coding your own carousel plugin. In addition, some of these sliders are not responsive or the controls don’t work on mobile. This is not the case for Soliloquy sliders. If you need a versatile carousel for your WordPress site, one that can be modified in just about any way you can think of — many of your options requiring no coding knowledge — then this plugin is the way to go. Here are just a few of Soliloquy’s customization options. One of Soliloquy’s defining features is its ability to be tweaked and modified to fit any site or need. Many sliders can’t be changed very much besides a few basic settings. But if you can think of something your slider needs to do, Soliloquy probably has the option built in. This isn’t a comprehensive list of all of Soliloquy’s customization options, but many of its best features are listed here. If you’re looking for a few extra ways to tweak your carousel, this is the place to be. Some of the most dramatic changes you can make to sliders come from the multiple addons. These allow you to do anything from customizing with CSS to scheduling slides you want to appear on certain days or times. The dynamic addon allows you to create carousels on the fly, while also pulling its images from sources like categories, folders, and even other gallery plugins. 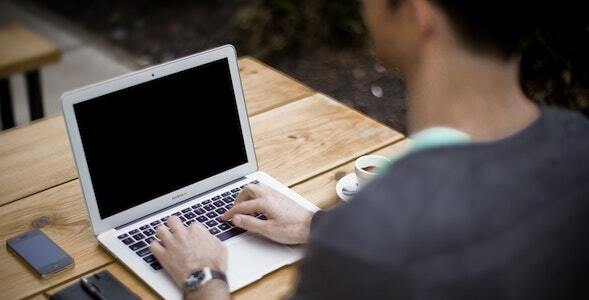 Meanwhile, the featured content plugin allows you to show off your latest blog posts. Some addons let you customize the way your carousels look. For instance, the thumbnail plugin previews upcoming slides in a small thumbnail. The lightbox addon lets you pop out images into a black background, perfect for viewing photography without interference. There are even themes for your slider that drastically change their appearance! 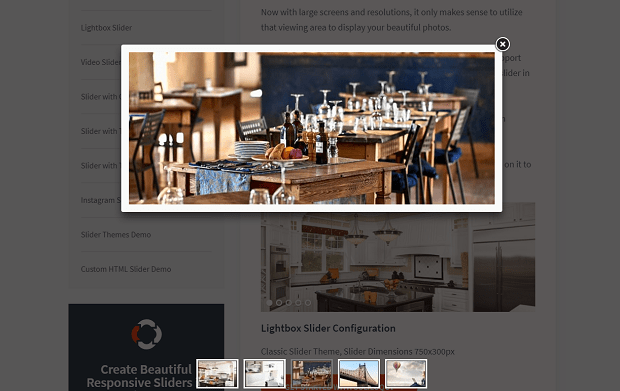 Third-party sliders include Instagram and WooCommerce sliders. Show off your newest photography, or get more sales by displaying WooCommerce products! That’s only a sampling of the addons Soliloquy offers. If you want to change your sliders at the click of a button, these will allow you to do so. Featured content may seem like a simple functionality; you’re just pulling from your recent blog posts, right? But there are a lot of ways to refine this nifty feature. Do you use a snippet of your article in the slider? You may want to limit the length of the caption, and this can be done by simply tweaking the slider options. You can also change to call-to-action to say whatever you want. But that’s just the beginning. You can also add other slides to your featured content carousel, display custom fields on the slider such as article category, filter your featured content and exclude certain articles, and change the link or featured images of the slides. With Soliloquy sliders, you’re not just limited to simple images. Videos, text, buttons, and forms are all options. If you can think of something to do with the UI, it’s probably possible with enough coding know-how. Adding videos is almost as easy as creating images. 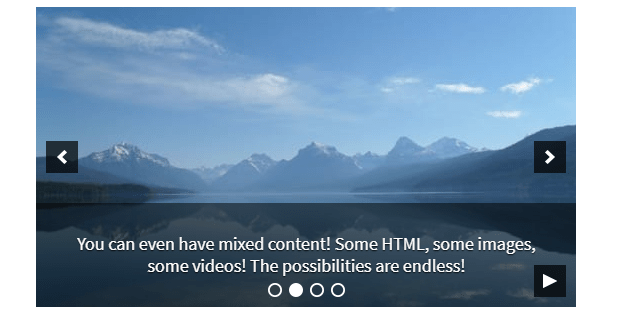 Self-hosted, Youtube, Vimeo, and Wistia videos can all be added to a slider. Just go to your slider upload screen, upload files from other sources, and enter the link to your video. Add a caption and a title, and you’re good to go. For text, forms, and similar things, you’ll want to create an HTML slider. You can paste shortcodes in, so if you have button or form shortcodes, you can place them inside your slider. Don’t forget PDF slideshows to convert PDF files to images. You can also mix-and-match any one of these. So feel free to have an image on one slide, a video on the next, and finish it off with a form! Unlike other sliders, Soliloquy comes packed with a bundle of mobile-exclusive tweaks and features. You don’t need to worry about mobile or tablet users being unable to interact with your carousels. Do you want your mobile sliders to show captions? If the captions are important to the context of the images, make sure to check out the “Mobile” tab while you’re customizing your slider. Here you can enable and disable captions on mobile. Maybe you want to disable mobile touchswipe? If you want users to only interact with your slider through the navigation buttons, or not at all, this is an option as well. You can also disable the lightbox feature on mobile if you want to. Finally, if you simply don’t want mobile users to see sliders at all, you can turn them off completely, so only computer visitors will be able to see your carousels. Captions seem like a simple feature, but they can be customized near endlessly with Soliloquy. For instance, you might want to set a default caption if you find yourself using the same one frequently, or toggle the caption on and off when a link is clicked. There are also a bunch of ways to customize the caption. Maybe you want the image and caption side-by-side? Or you want it to appear on hover? Or reposition the caption even so it’s below the slider entirely? All this is possible. Even if you’re not great with CSS, our docs and tutorials should be able to help you along. It’s a breeze to customize when slides appear, the navigation buttons, and if slides advance at all. Show navigation arrows or bullets on hover, so people can look at your images without any UI elements interfering. Alternatively, force the elements to always appear. Add a slide counter, reposition the navigation elements wherever you want, or put text in the arrows. Customizing the navigation arrows and the play/pause button to suit your site’s theme and individual tastes isn’t hard. Call attention to your carousels by making them stand out. The lightbox is one of the major Soliloquy addons. Lightboxes can be customized with CSS, allowing you to style elements as you wish. You can make your slide captions link to a lightbox image, or hyperlink the image within a lightbox. Or you can make a lightbox appear as soon as you open a page. 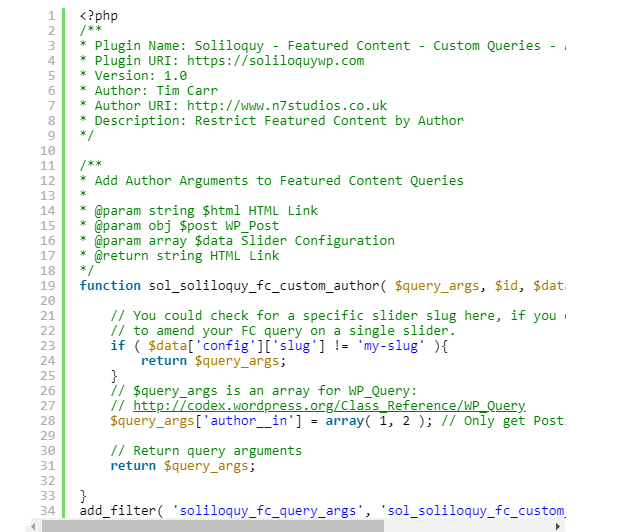 You can see now that Soliloquy is one of if not the most customizable slider plugins you can find for WordPress. If you can think of a creative way to use your slider, there’s a good chance that you can do it with Soliloquy. You can even take out the carousel part and just use the UI, if you want to! With so many options, there’s no reason not to use this versatile WordPress addon. Did this guide help you customize your slider? 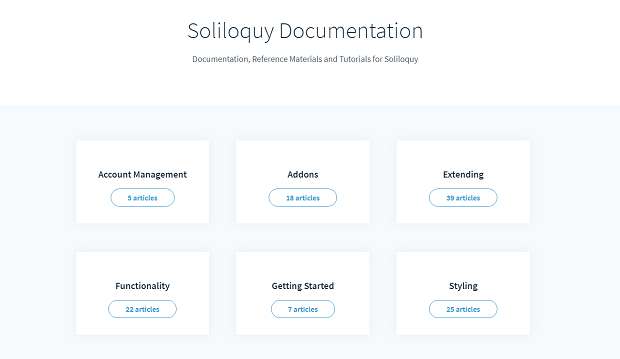 If you have any ideas for additional Soliloquy addons and functionality, share them with us in the comments below. And check out our Facebook and Twitter for more help using Soliloquy.